#WhoIAm Photo Series Mission: As women’s sports continues to gain acceptance and appreciation, each girl athlete is a part of a larger phenomenon never quite explored before—while we are accepted by society, the forces of our male-dominated sporting culture is still pushing back on those of us who have sweated out make-up, called a "tomboy", and traded in cleats for heels. #WhoIAm shows the identities and the complex experiences of growing up, in our generation, both a girl and an athlete. See the final gallery and hear from the Editor-in-Chief and the photographer, reflecting on the project as we wrap up this round of "Who I Am: A Girl and An Athlete". Bea Chang (Editor-in-Chief): "Wow, I can't believe the "Who I Am: A Girl and An Athlete" project is already coming to an end. I am not sure where the idea for the project came from. It could've materialized sometime during Basketball Education in Action's workshop on "Girl Jocks" back in May. It could've been all of those weekends when I tried to figure out if I'd be respected more as a coach if I dressed up in boots or dressed down in sweats. It could've been that despite all the evenings I spend with the girls, I still have a hard time recognizing them in their street clothes. It was hearing stories from girls and parents alike, or witnessing it almost every day, how much who they are as athletes come in conflict of who our society still expects girls to look like. There's the pink ribbons in their ponytails, the pink basketball shoes. There's the mascara during games, the straightening of hair before a team photograph. But perhaps what I saw in them was also me at thirteen, fourteen, fifteen, sixteen years of age, trying to figure out how to be comfortable with who I was most of the time, how to feel "cool" and beautiful in my chosen identity. Anyway, that was what I wanted to capture, and who else better to do it than another basketball player, coach, and photographer, Tara Brown. 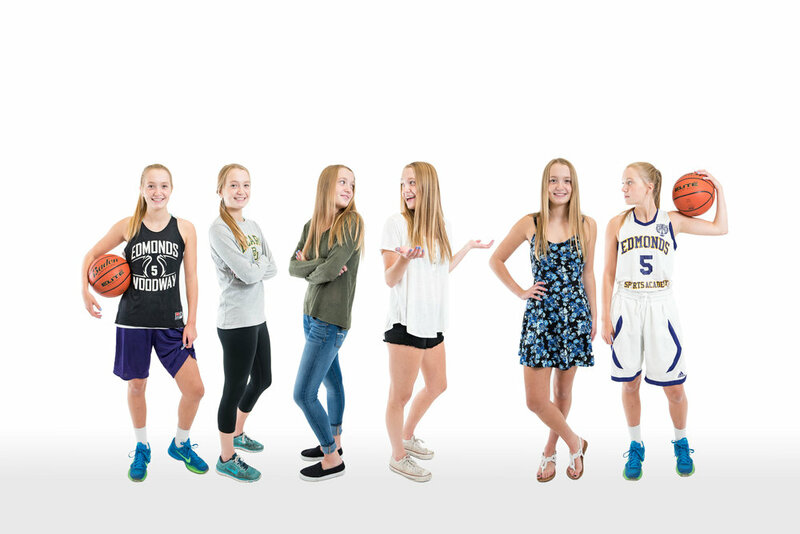 I think what she so illustrated so well in the composite photography of our high school athletes is the various identities each one of our girls embody almost on a daily basis, which is so familiar to all of us who's ever run into a bathroom after a game, washed her face, and put on a dress and heels. What I didn't know when we first started out was what the message of all of this was. And I think, just now, I've finally figured it out. At least for me, the message is this: whatever identity the girls embody at any given moment -- whether it is a student in jeans, a girl in a dress, an athlete in running attire, or an athlete in uniforms -- each of them is beautiful beautiful in her own way. I want to give my sincerest thanks to the tremendous time and skills that Tara has given so willingly to this project. I also want to thank the parents and the girls for being open to such a vague, crazy idea from its conception. And, finally, I want to thank you, the readers, for checking back each Tuesday, for reading about the lives of these girls, and for sharing the mission of the Awesome Sports Project to your families and friends. Read on, for the final words from our photographer, Tara Brown!" Tara Brown (Photographer): "The moment that Bea approached me about photographing Mady, Missy, Haley and Sydney for the Who I Am project, I was all in. I absolutely wanted to be able to help these amazing girls express their different personas. I've played sports since I was eight-years-old and have always strongly identified as an athlete. But similar to these girls' stories, there have been times where I've had to choose between my athlete identity and my many others, or times where being a female athlete didn't feel as important as a male athlete. I remember leaving a softball game early to attend my final middle school formal dance; I remember having just a handful of friends in the stands at our games whereas the guys' games were always packed; I remember trying out for the crew team in college and having several people ask me if most of the team was gay because they just assumed we would be; I remember playing pick-up basketball with a bunch of guys in college and an older man was aggressively pushing and shoving me on defense because he didn't want me to score. But I also remember the amazing moments, like winning a cross country race or a basketball tournament, like being able to teach youth athletes at camps, and like meeting practically every friend in college on the basketball court, and many, many, many more. Every group, no matter what their identity, has its stereotypes - sometimes they're positive and other times not so much. But I've found that being a female athlete just means that you get to break through so many of them and leave people scratching their heads. I can only speak for myself, of course, but being an athlete has given me confidence and drive in all other aspects of my life. Sports have become less of a center of my life as I've entered adulthood and started a career and my own business, but those qualities I've gained from them - teamwork, leadership, discipline, mental toughness, positive thinking, and even the ability to love and accept myself even when I'm not the best - have molded me and helped me be successful. And those negative experiences we encounter only give make us stronger, help us learn how to handle the situation next time, and help us have empathy towards other human beings going through similar things. But the positive experiences - wow - those positive experiences make our lives incredible. I don't for a second think I would be who or where I am today if I hadn't picked up a softball or basketball or put on some running shoes. It makes me so proud to see more and more girls playing sports, and especially to see them continue through middle school, high school, college, and beyond. I actually became more passionate about and better at basketball in college because I was one of the only girls who ever played pickup with the guys. And now when I walk into a gym I see squads of girls waiting for the next run. The playing field may not be level for a while; female athletes will continue to experience certain inequalities or judgments as our society struggles through many social issues around gender and racial equality... but I see the progress. It's happening. And that gives me hope. So to all the female athletes out there, of any age - keep ballin', keep liftin', keep hustlin', and most importantly, keep doin' you. Because the next generations are watching." Thank you all for being a part of this project! Share with your friends and leave *awesome* comments below!